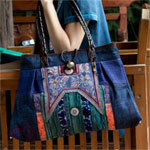 Chirada Loetparisanyu transforms cotton and leather into a shoulder bag of ethnic grace. The exterior is decorated with a patchwork of woven, embroidered and stitched hill-tribe patterns. It is fully lined with cotton and features three inner pockets, one with zipper to keep small items secure and one for cell phone. It closes with a zipper and is further secured with a hoop over a ball. 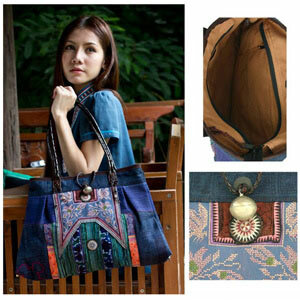 This bag will lend an ethnic touch to any wardrobe.